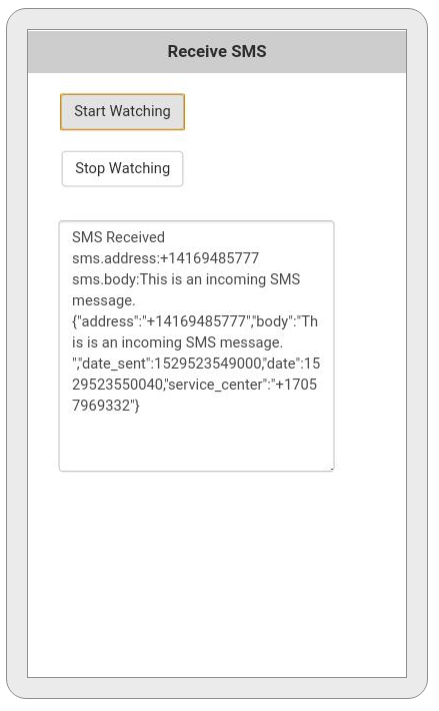 You can now receive incoming SMS messages (text messages) on Android devices, using the sms-receive plugin. It does not intercept them – the messages still go to the Messages app. It only works if your app is compiled under PhoneGap. Your app doesn’t have to be in the foreground – it will received the messages so long as it has been started. The received message is available as variable in your app – so you can use it to update databases, inform the user or all kinds of things. Due to changes in Android OS, this post is deprecated starting with AppStudio 6. Splash screen support for Android Home screen apps was added in Chrome 47, released in December 2015. It gives your web apps a look much more like a native app at startup. There are a few new items in Project Properties for this. They are grouped together under the ‘WebApp Chrome’ heading. The screen will then shift to the orientation you specify and ignore the actual orientation of the device. The screen orientation still won’t change on an iPhone, but at least there won’t be an error! AppStudio 4 makes it much easier to use the camera from your device. Before, there was a complex chain of events which had to be managed, and a bug in iOS made things difficult. Google recently added a little trick to Chrome, allowing apps to become full screen. It works on both the Desktop and Android devices. You’ll need to be running Chrome Version 32 or newer. After going to full screen, a message is displayed telling how to go back: swipe down on an Android device or hit escape on the desktop. As of Chrome 32, this is no longer needed. Here’s how it looks on an Android device. This won’t work with the Android Browser or iOS. This won’t work with PhoneGap, as long as it still uses the Android Browser. It seems to have to be done from a button: just putting it in Global Code does not work. Let us know if you find out anything more about this trick! There has been some confusion in the Android world lately due to the two different browsers on Android devices. Some devices run one, some the other and some run both. Here’s a rundown on what we know about them and how they differ. Can AppStudio apps be installed on Android without the net? We had an interesting support question today. Is it possible to install an app created with AppStudio on an Android device without an internet connection?